Cyclone II is a stallion from Nightmist's 2008 foal crop. He is a full brother to Summers Nightmist and Minstrals Stormy Weather. Cyclone II was born on Mike Pryor's farm in Pennsylvania and was sold to Stag Creek Farm in Texas. 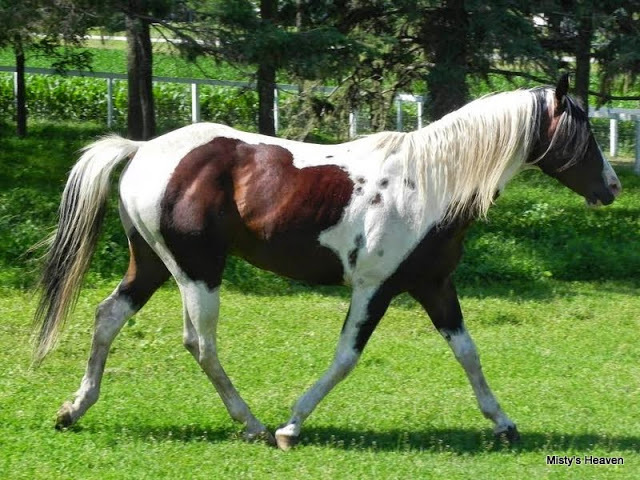 After a couple years he was sold to Rebekah's Horse Ranch in Minnesota where he still resides. Cyclone II sired two foals in 2011 while in Texas, a black pinto stallion Firefly Mist and bay pinto gelding Moontide Mist. After his move to Minnesota he sired two more foals in 2013, bay pinto geldings Misty's Dash for Freedom out of Bryant Farm's Liberty and Hart's Skip for Joy out of Bryant Farm's Hope. In 2015 he sired Hart's Dancing Jubilee out of Bryant Farm's Liberty.